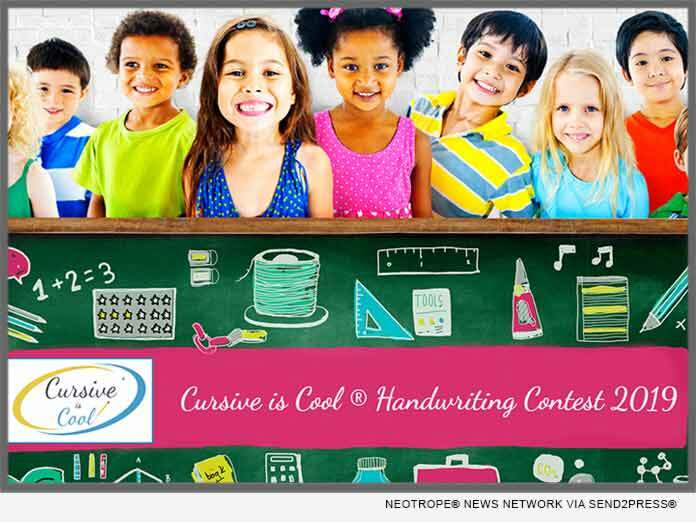 (LOS ANGELES, Calif.) — NEWS: The annual Cursive is Cool(R) contests for 2019, under the auspices of the American Handwriting Analysis Foundation, will launch on National Handwriting Day, celebrated around the world on Jan. 23 each year. Cursive writing continues to enjoy increased appreciation in the United States and around the world. Scientific studies reveal the benefits of writing by hand to positively impact motor skills, cognitive development and improved learning outcomes such as better recall and retention for young learners. Campaign for Cursive(R) offers three contests: one in the USA and two in Canada (one for English writers, one for French). Grade 1-6 students have the chance to test their cursive skills as well as their creativity in answering one of the posed questions. The deadline for all the contests this year is March 8, 2019. A page with Frequently Asked Questions (FAQ) has been placed on the website to help parents and students as they get ready to write their entries. Entries for each contest are submitted in different ways and full information can be found on the Cursive is Cool(R) website. Winners of the contests will receive medals, certificates, fun new writing instruments, and accessories. Supporters of the contest include the American Handwriting Analysis Foundation, Amsterdam Printing, CursiveLogic, Fahrney’s Pens, Laywine’s, New American Cursive Penmanship, Pelikan, PEN World, Retro51, Sakura, and Staedtler. The contest has two new supporters this year: Bittner Pens and Monkey Magnets. Contest judges are handwriting specialists, handwriting analysts and educators. Entries will be scored for neatness, legibility, consistency and creativity. Winners will be notified 3 to 5 weeks after the close of the contest and posted to the organization’s website and social media channels. For more information, please contact Gayna Scott, Chair of Campaign for Cursive(R) at gayna@comcast.net. The American Handwriting Analysis Foundation is a 501-(c)6 non-profit business organization, chartered and incorporated in California. Dedicated to the advancement of the handwriting sciences, AHAF promotes education for handwriting examiners at all levels of expertise and from all schools of thought. Information: https://www.ahafhandwriting.org/.